For the cinema crazy Chennaites, cinema was the referral theme for most things. The arterial Anna Salai (Mount Road) had so many theatres – bus stops came to be known by the nearby theatres. In one stretch, there were the famous Shanti, Devi Complex, Wellington, Alankar, Anand, Saffire and more – not to speak of Chitra, Casino, Odeon etc., situated nearby. For those of us living in Chennai and travelling in the arterial Mount Road (Anna Salai) – life is going to change….. the City is already bursting at seams due to ever growing traffic – there are assortment of vehicles – transport corporation buses, share autos, cars, vans, the ubiquitous 3 wheeled autos, two wheelers and more… fortunately you don’t encounter horse-drawn or bullock drawn vehicles. Traffic snarls are too common as vehicles try to by-pass another. You either feel like keeping out of the City or pray the need for better roads and many parallels roads. To cope up with the rapidly growing population and traffic volumes, the new rail based rapid transport system has been conceived as a viable alternative. It is the Chennai Metro Rail Project. This is a project aimed at providing the people of Chennai with a fast, reliable, convenient, efficient, modern and economical mode of public transport, which is properly integrated with other forms of public and private transport including buses, sub-urban trains and MRTS. It is to be constructed in phases. The Phase I of the project consisting of two corridors covering a length of 45.1 km is under construction. The elevated section of the project is scheduled to be operational by 2013 and the entire project is scheduled to be completed by the financial year 2014-2015. About 55% of the corridors in Phase I is underground and the remaining is elevated. Corridor 1 is intended to cover the Anna Salai stretch and corridor 2 is intended to cover Poonamalle High Road and Inner ring road. One would be thrilled to think of travelling below the ground and there would be 12 Underground stations proposed to be at : Sathiyamoorthy Nagar,Tiruvottiyur, Washermanpet, Mannadi, High Court, Chennai Central, Tamil Nadu Legislative Assembly, LIC, Thousand Lights, Gemini, Teynampet, and Saidapet. The physical works are already in progress as could be seen and experienced by many of us whilst travelling. To accommodate construction work for the Chennai Metro Rail project, Traffic Police have made changes which are to come into effect from March 3, 2012 (Saturday). 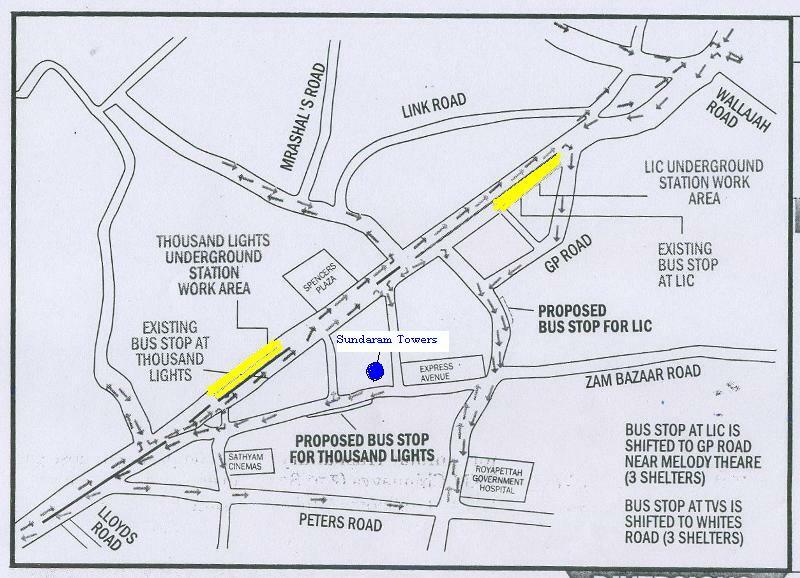 The majorly affected stretch would be the one from LIC building till Thousand Lights area – which is to become ‘One way’. According to an official press release, the stretch on Anna Salai from Thiru.Vi.Ka Road junction up to Wellington junction will be made one-way with entry from Whites Road junction towards the LIC. The existing one-way on General Patters Road will be reversed and vehicles allowed from Wellington Road junction towards Royapettah tower clock. Whites Road will be made one-way with entry from Royapettah tower clock. Road will be made one-way with entry from Spencer's Plaza junction. The stretch of Smith Road will be made one-way with entry from Whites Road junction. Motorists coming from the Anna statue and proceeding towards Gemini Flyover or Teynampet will be diverted at Wellington junction towards G.P. Road via Whites Road and reach Anna Salai. Motorists coming from the Anna statue and proceeding towards Binny Road will be diverted at Wellington junction to take route via. G.P. Road -Whites Road-Smith Road-Anna Salai to reach Binny Road. Motorists coming from Bharathi Salai (Zam Bazaar) intending to go towards Anna Salai should take route via Whites Road and Smith Road to reach Anna Salai. Vehicles coming from Government Royapettah Hospital (Westcott Road) and intending to go towards Anna Salai must take the left and take the route via Whites Road – Smith Road to reach Anna Salai. Motorists coming from Binny Road intending to go towards Sathyam theatre or Teynampet should take the route via Pattullos Road -Whites Road – Anna Salai to reach Teynampet. Motorists coming from Binny Road and intending to go towards Royapettah clock tower, Bharathi Salai and Royapettah High Road should take the route via Woods Road - Tower Clock. Motorists coming from Greams Road intending to go towards Gemini Flyover should take the route via Thiru-vi-ka Salai – Whites Road, the release said. Those travelling from Anna Flyover (Gemini) towards Santhi / The Hindu / Anna Statue will not be affected and would perhaps feel easier flow as that stretch from near Thousand Lights – TVS – Spencers – LIC – Dhun Building would be One way with no vehicles coming on the opposite side. Bus stops would be shifted accordingly, which sure is going to create a lot of commotion in the early days, till the dust settles down. As understood, the one in front of LIC hitherto, would be shifted to GP Road and the bus stop at TVS (now for commuters going towards Gemini / Teynampet) would get shifted to Whites Road. (For those outside Chennai, our Sundaram Towers and Deshabandhu Plaza are situtated in Whites Road) – Whites Road would soon see greater traffic flowing. One only prays that this arrangement does not paralyse the way we commute to Office……………..
India, the greatest democracy is known for its diverse culture. Just as the vastness of the land, the politics of India is also too vast. Often the State and National political streams do not go together and National parties often are at the mercy of State parties, especially when it comes to governance of the States and local bodies. It is the largest province in India, in terms of population and in terms of land mass fifth after bifurcation of Uttaranchal. It earlier decided the governance of India, especially the Prime Ministerial berth as it has returned notable Nehru dynasty including Rahul Gandhi, Varun Gandhi, Maneka Gandhi, Indira Gandhi as also from the opposite side Atal Behari Vajpayee. The legislative assembly has 403 seats, 206 of which were won by the BSP in the previous election. Yes, it is the Uttar Pradesh where assembly elections have been held. Arising out of its vastness and sensitivity, elections were held in seven phases to decide whether Bahujan Samaj Party and Mayawati would be able to retain the governance or would it throw a different result ! Corruption is often the common issue in most States and Mayawati is no exception – some even state that she stands tall as the leader; she is one among the highest tax payer. In the present tenure, she has been accused of constructing parks and statues of herself and other leaders at crores of exchequer rupees, in the name of development and social upliftment. On 7 January 2012, the Chief Election Commissioner S. Y. Quraishi ordered for the veiling of statues of all political figures except for Mohandas Gandhi, as well as veiling the BSP's symbol the elephant, in order to have a "level playing field". The votes are to be counted on 4th Mar 2012 and being EVM poll, results should be out sooner before the end of the day – revealing who would have the mandate for another 5 years. In a move which could start debates on whether it is politically motivated and whether it is timed to be done after the last leg of Assembly elections, the Central Bureau of Investigation (CBI) has stumbled upon a lead in National Rural Health Mission (NRHM) scam, which may land investigators at the door of Chief Minister Mayawati. Despite the Central Government’s categorical instructions that Family Welfare department should not be separated from Medical Health, Mayawati’s office gave permission for creation of a ‘mechanism’ to use NRHM money for family welfare schemes. It is now stated that the former Minister for Family Welfare Babu Singh Kushwaha known for his proximity to Mayawati in the Cabinet during its initial days, was given permission in early 2009 to create 72 posts of CMOs overnight under Family Welfare and fill these vacancies to carry out medical projects under NRHM. It is stated that Kushwaha himself sent this proposal to Mayawati and her office returned the proposal with a note that `it has the approval of the CM’. According to CBI sources, no procedure was followed in the appointment of new CMOs. Existing CMOs were excused from handling NRHM projects on the grounds that they had too much on their plates and they should concentrate on public health. Overnight, the vacancies were filled and NRHM money was put to use at an extraordinary speed. Till now, the Central Government has given the State Government Rs 9,472.25 crore under NRHM. There were two CMOs now in each district in UP – one for the Medical Health and another for the family welfare. Interestingly, only the CMOs representing Family Welfare were authorized to use funds allocated under the NRHM. Though public health is a State subject and the creation of two separate posts of CMOs does not constitute criminal culpability, the CBI fears that creation of entire chain of new CMOs without any norms and procedures created a mechanism for `open loot’ and NRHM money was diverted without any disdain. In Bhim Nagar District, 70 women were listed delivering 250 children in less than two years. For each delivery, a woman gets Rs 1,400 under NRHM. In some districts, NGOs simply culled out names of people over 60 years of age from the voters’ list and footed bills of cataract operations worth lakhs of rupees under NRHM. It is stated that over Rs 9,000 crore was spent in the name of NRHM. The CBI has only investigated cases worth Rs 320 crore so far and that the money trail is still on in some cases. In some cases, the money trail is still on. It is an equipment, part of a Ship – an Anchor – a device, generally made of metal – used to prevent vessel from drifting due to wind or current. The word derives from Latin ancora, which itself comes from the Greek ankura. There are different types of anchors. All of us use Internet, and some cannot live without Internet connection – some get very perturbed if the speed is not up to desired levels – it has become such a part and parcel of day to day life. Internet primarily is a global system of interconnected computer networks that use the standard Internet protocol suite (TCP/IP) to serve billions of users worldwide. It is a network of networks that consists of millions of private, public, academic, business, and government networks, of local to global scope, that are linked by a broad array of electronic, wireless and optical networking technologies. Without the Internet, you may not be able to access any of the sites or documents in World Wide Web (www) or send e-mail communication. But what is the connection between an Anchor and Internet connection ? Your PC or laptop might work wireless – but despite the hi-tech image that we have in mind, there is physical connection put in place through sheer physical effort, mostly that of expensive fibre optic cables, laid at a great cost around the globe that directs and controls the internet traffic. Now there is news that East Africa's high-speed internet access has been severely disrupted after a ship dropped its anchor onto a fibre-optic cable off Kenya's coast. The ship was waiting to enter Mombasa - one of Africa's busiest ports - when it anchored in a restricted area- and it could take could take up to 14 days to repair is what is causing worry. This reportedly is one of three undersea cables to have arrived in the region since 2009, which has provided faster internet access to this part of the globe. It is the bandwidth which determines traffic and its speed and the increased bandwidth had given a boost to mobile services to Kenya. The Indian Ocean fiber-optic cable, known as The East African Marine Systems, or Teams, is owned by a group of telecom companies and the Kenyan government. It was the fourth cable to be severed in the region since Feb. 17. BBC reports that it was the cable run by Teams that was damaged at the weekend. Internet service providers and mobile phone operators have re-routed to the Seacom link - which was not damaged by the dropped anchor. But the company has only bought a small amount of bandwidth because of cost. It is reported that as a consequence, internet connections are expected to slow down by 20% in Kenya, Rwanda, Burundi, Tanzania, Ethiopia and South Sudan's capital, Juba. Seacom - the first to be up and running - links East Africa to Europe, India and South Africa. Teams links the region to the United Arab Emirates - and Eassy, which went live in July 2010, links countries along the East African coast. This is reportedly the second incident as 10 days ago, Teams cable had severed in Red Sea between Djibouti and the Middle East. It was apprehended that a passing ship could have caused the damage because the Red Sea is unusually shallow. These cables are known as submarine fibre-optic cables and each of them is typically composed of about four strands, each one the diameter of a human hair and sheathed in a thick steel armor. The strands are capable of carrying millions of phone calls and data connections at once.A submarine communications cable is a cable laid on the sea bed between land-based stations to carry telecommunication signals across stretches of ocean. The first submarine communications cables carried telegraphy traffic. Subsequent generations of cables carried first telephony traffic, then data communications traffic. All modern cables use optical fiber technology to carry digital payloads, which are then used to carry telephone traffic as well as Internet and private data traffic. At Hobart only the die-hard fan nursed any hope, perhaps it looked as if the Team itself had given up. More so when Lankans posted a great total (read improbable and impossible to chase) of 320 aided by centuries by Dilshan and Sangakkara. It looked a true end for a troubled series. Not many would have chosen to follow up – India began their chase majestically but soon found Sehwag and Tendulkar albeit after a brisk start. Earlier, on a day, when Dhoni would have expected a burst from one of his key bowler – the bowling was wayward and they were hit all over the park as Tilakaratne Dilshan made his 11th ODI century and Kumara Sangakkara also dazzled. Needing to overhaul 320 itself was difficult but the plot was to overcome it before 40th over to win the much needed bonus point. It was Virat Kohli all the way – though good contributions did come from Virender Sehwag, Sachin Tendulkar, Gautam Gambhir and Suresh Raina also. Now Indians have 15 points equaling Sri Lanka – Aussie have 19. If only Australia beats Lanka in the last of the league match, India should be through to the finals of this 3 Nation tournament. With regards – S Sampathkumar. On 22nd and 29th of Jan 2012 – we conducted Childfest - event sponsor being Gold Winner. We have been conducting the competitions for School children providing them a platform to showcase their talents and improve their confidence. Our Q for the month : At Brisbane ODI, R Ashwin ran out Lahiru Thirimanne, though Sehwag subsequently withdrew the appeal. Do you know what is ‘mankading’ in Cricket ? We are at the fag end with two matches left – the field is not wide open as could be read from the above table. Whether India would ever sneak in, only the hard believer is nursing some hope for India getting a possible 3 final matches on Mar 4, 6 and 8th – reality appears bleak as India won the toss and put Lankans to bat desperately seeking that elusive win as also a bonus point. Certainly another tour which the Indian fan would like to forget for the disappointments kept coming. Bowling has appeared weak, batsmen have not been scoring – their ego and reputation battered and bruised, the team would return to the shores for Asia Cup followed by IPL 5. Sad that the team appears to have given up quite early and not keeping up their pride – a misery which the Teams of early 90s and earlier nursed. The man who recently broke the World record scoring 219 is not firing – he has scores of f 23, 10, 20, 0 and 5. Sachin has bee failing – no order in the middle. There has been no century from any Indian batsmen in the whole tournament and things are only looking bleak. An article in Cric info by Sidharth Monga condemned the Team for not doing the basic – not on the field – off it. India have a head coach, a fielding coach, a bowling coach, and other support staff that includes an analyst, a trainer, a physio, and a masseur. Then there are 17 cricketers. Between them not one had bothered to check the playing conditions and inform the captain that India were still alive in the tournament - only just, but alive. It looks a Team ready to travel back rather than fight by the skin of their teeth. The younger brigade - Suresh Raina, Rohit Sharma, and Ravindra Jadeja have not done any justice to the opportunities heaped on them. In end, India has looked a very ordinary side incapable of thinking of a win, which is very sad for ardent followers like us. Kudankulam protests funded by Foreign agencies says PM..
All is not well at Kudankulam and some sinister designs are keeping the agitations alive….. Why is the Govt. not taking any stringent action in putting down such protest when the Prime Minister himself recorded that protests against the Nuclear plant are funded from out of the country ! How and why these protesters be allowed to hold their sway and how can they challenge and stop even Scientists from entering the Plant is a mystery !! Half a century ago, this place – Kudankulam lying in Tirunelveli district was an obscure place, not known to the rest of India. It gained prominence after the Nuclear Power station - Koodankulam Nuclear Power Plant (KKNPP) coming up over there. A Plant of such strategic importance and magnitude did not spring up overnight. It was signed by the then PM Rajiv Gandhi and Soviet President Mikhail Gorbachev on November 20, 1988 after being conceived in mid 1980s. A small port became operational in Kudankulam by Jan 2004, able to receive barges carrying over sized light water reactor equipment from ships anchored at a distance. When the Plant was nearing its final stages, concerted protests came to light claiming that it is not safe; a group hitherto unknown calling itself - voluntary People's Movement Against Nuclear Energy sprung into action stalled the movement of staff and scientists. They protests stating that the plant is unsafe and its head Udayakumar had the audacity to question the veracity and knowledge of beloved Dr APJ Abdul Kalam – the Q whether Dr APJ is a Nuclear Scientist does not deserve to be answered for the simple fact that Kalam certainly knows better than you, me and the protesters and certainly has more concern for the Nation than all of us. Only recently, Prime Minister Manmohan Singh in an interview to the American journal 'Science' blamed US-based NGOs for whipping up a campaign against the Russian-aided Kudunkulam atomic power station in Tamil Nadu, causing a major setback to the project. Some newspapers including Times of India and Dinamalar have been reporting the real picture and have been publishing reports of foreign agents being behind the protests. This news item in TOI adds more concern to the on-going agitation. TOI reports that a 50 year old German National was arrested by Tamilnadu Police by ‘Q’ branch sleuths, who monitor the activities of non-governmental organizations in the state. It is reported that Sonnteg Reiner Hermann of Germany was arrested in Nagercoil. How a foreigner was allowed to organize protests against our Govt will remain a mystery but why did the people included him or were behind him in such protests ? Was it simply for monetary gains or was it part of a bigger sinister plan ? Police sources are reported as stating that Hermann came to Nagercoil on a tourist visa and was staying at Ganga Lodge in Vadaseri. Police searched his room and found evidence that he had been mobilizing funds for anti-nuclear activists, an officer said. There are reports that he would deported immediately but why not take action against him and imprison him for his anti- India activity ? It is 128 years since the death of a great Son of India – quite unfortunate that many of us do not even know about him, leave alone remembering his patriotic deeds. The British East India Company was granted a Royal Charter in 1599, operated its own large army, entered India as traders slowly gained entry by deceitful means and then controlled major portions of India. The East India Company were to trade in cotton, silk, indigo dye, salt , saltpetre, tea and opium – they became rulers, effectively from 1757 after the Battle of Plassey and lasted until 1858, followed by the British Crown assuming direct control of India under British Raj. The rulers plundered and took away riches of the Nation in abundance – more importantly, they rewrote History suiting their style and ensured that the heroic patriotic deeds of many Great sons of this motherland were not properly portrayed. It is more than 64 years since the British left, but still the Indian history is not properly re-written, giving due Credits to the selfless sacrifices of Great Patriots. In the end, we study history as the legacy of British, read about Viceroys and their administrative set-up but scanty details of our own Noble Freedom Fighters – most of whom are only part of local legend but not known throughout the Nation. Perhaps one such is “Veer Sundar Sai” a great fighter who sacrificed his life fighting against the British and died in obscurity. Surendra Sai has a demi-god status in Western Orissa – the Kosal region. As could be easily deciphered, it derives its name from the Mother of Lord Rama – Kousalya. Kosala Proper or Uttara Kosala is the kingdom of the celebrated personality of Treta Yuga, Raghupathi Ramar. Rama's sons Lava and Kusha inherited parts of this kingdom. Lava ruled from the city called Sravasti and Kusa from the city called Kushavati. Dakshina Kosala or Southern Kosala was a colony of Kosala kings identified to be the Chhattisgarh state and western Orissa region of India. 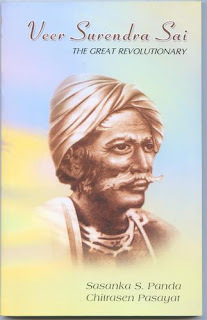 Surendar Sai and many of his associates like Madho Singh, Kunjal Singh, Airi Singh, Padmanave Guru, Trilochan Panigrahi resisted the Britishers and successfully protected most parts of Kosal region for some time from the British rule.Most of them died unnoticed fighting for freedom from the Britishers. Many of them were hanged by the Britishers; a few died in the Cellular Jail in the Andamans. Surendra Sai was born on 23 January 1809 in a Village called Bargaon in Khinda about 30 km (19 mi) to the north of a town called Sambalpur in the Kosal region. His father was Dharma Singh and he was one of seven children. Surendra Sai was a direct descendant from Madhukar Sai, the fourth Chauhan king of Sambalpur and therefore was eligible as a candidate to be crowned as king of Sambalpur after demise of King Maharaja Sai in 1827. deceitfully, the British authorities removed Rani Mohan Kumari, widow of the King, from power and put Narayan Singh, as the king of Sambalpur, ignoring the claim of Surendra Sai for succession. Rebellion broke out in the regime of Narayan Singh. In an encounter with the British troops Surendra Sai, his brother Udyanta Sai and his uncle Balaram Singh were captured and sent to the Hazaribagh Jail where Balaram Singh died. King Narayan Singh died in 1849. By virtue of the Doctrine of Lapse, Lord Dalhousie annexed Sambalpur in 1849, as Narayan Singh had no male successor to succeed him. During the uprising of 1857 the sepoys set Surendra Sai and his brother Udyant Sai free. The resistance to British continued in Sambalpur under the leadership of Surendar Sai. He was supported by his brothers, sons, relatives and some Zamindars. Surendar Sai espoused the cause of the downtrodden tribal people in Sambalpur by promoting their language and culture in response to the higher caste Indians and the British trying to exploit them to establishment their political power in Western Orissa. Surendra Sai began protesting the British at age 18 in 1827, moved operations to the hilly tracts of Western Orissain 1857 and continued until he surrendered in 1862 and went to Hazaribagh Jail. He was incarcerated for 17 years and after his final arrest served another term of 20 years including his detention of 19 years in the remote Asirgarh hill fort until he died. The Indian Revolution was suppressed by the end of 1858, but Sai continued his revolution. The military resources of the British were pulled up against him and the brilliant Generals like Major Forster, Capt. L. Smith and others earned credit in suppressing the rebellion elsewhere in India were brought to Sambalpur to stamp out his revolution. But all attempts failed and Surendar Sai succeeded in foiling strategy of the British for a long time. The British seized the entire food-stock of the rebels but also stopped all resources of the supply of food and other necessaries of life for them. Major Impey abandoned the idea of violent war and cautiously followed the policy of peace and good-will with the approval of the Government of India. Surendar Sai, one of the greatest revolutionaries in history, and a warrior who knew no defeat in his life surrendered with full faith in the honesty and integrity of the British Government. Sambalpur was one of the last patch of land to be occupied by the British Empire in India, not counting the Princely States. This was largely due to the effort of Surendra Sai. He was a very good swordsman. "Veer" in sambalpuri language means fearless. Later "Veer" became a part of his name and he has been referred as so in history books. Surendra Sai launched the first freedom movement much before the Rebellion of 1857. He languished for many years in the prison and eventually died in Asirgarh Jail on 28 February 1884. Some accounts have his date of death as 23rd May 1884 also. Strange are the ways of the World – till a few months ago, he was Captain cool, a phenomenal strategist, man whose moves could never go wrong. He captained India to its second triumph in Cricket One Day World Cup in April 2011. People were searching for synonyms to accolades and it was revealed that the Man who had victories in Cricket WC – ODI; T20 WC in 2007; Indian Premier League and Champions League could do nothing wrong………… but the wheels of fortune have changed. After a disastrous tour in England where we lost all the matches, came the Australia tour – where again we lost all the Tests and have been doing poorly in the Tri Series involving the hosts and Sri Lanka. When the going is tough, there also comes in its stride situations adding to the disadvantages – some man made ! Whatever little chances Team India appeared to have had, vanished in thin air due to the stand of the Umpires – contradicting and both going against India. Law 33 is ‘Handling the Ball’ – Australians who contrive to exploit every situation know this rule too well. This Law provides that "Either batsman is out Handled the ball if he wilfully touches the ball while in play with a hand or hands not holding the bat unless he does so with the consent of the opposing side." A batsman is not out 'handled the ball' if: (i) He handles the ball in order to avoid injury; OR (ii) He uses his hand or hands to return the ball to any member of the fielding side with the consent of that side. At Perth in 1979, Pakistani batsman Sikander Bakht had been Mankaded by Alan Hurst earlier in the same day to end the Pakistan second innings. Whilst at the non-striker's end, Andrew Hilditch interrupted a throw from mid-on and passed the ball to the bowler Sarfraz Nawaz, who appealed. He was given Out and as usual Aussie Press lambasted Pak for violating the spirits of the game conveniently ignoring their own act. It thus far remains the only handled the ball dismissal to occur at the non-striker's end. Yesterday, . David Hussey was ruled not-out in an appeal for handling the ball under Law 33 as it was deemed he stuck his hand out to avoid an injury. Sachin Tendulkar was trying to complete a tight run when he found the bowler Brett Lee in the way near the striker's end. In going around Lee, he lost on valuable time and was caught short by a direct hit, but was given out without even consultation. Dhoni felt that Hussey's hand was stuck out far enough in front of his body to make self-preservation a dubious argument. As it would happen, Dhoni had to receive a different yardsticks too. He quoted the incident at Brisbane on Feb 19, 2012 when Umpire warned Vinay kumar for running up to midwicket for backing up a throw from point. Today Dhoni clearly felt that Billy Bowden should not have interfered with Simon Taufel, who anyway would not have had any hesitation in handing a rude decision. India played poorly is another thing but these decisions defied logic and get interpreted differently for different players / different countries. MS Dhoni tried to laugh at the reports of a rift and one only hopes that whatever is being seen or heard is unreal !!!!!!!! At Delhi, in the road to Olympics, Indian women team’s hopes of qualifying for the London Olympics went up in smoke after suffering a crushing 1-3 defeat against top-ranked South Africa in the finals of hockey Olympic qualifiers on 25th Feb 2012. World number 12 South Africa scored through Shelley Russell (4th minute), Pietie Coetzee (30th) and skipper Marsha Marescia (57th) to qualify for the London Olympics. They remained unbeaten in the tournament and had defeated India 5-2 in the league stage. India earned their first penalty corner in the 10th minute but Sushila Chanu failed to stop the ball cleanly to squander the opportunity. India could score only a consolation goal in the 56th minute with Jaspreet Kaur converting a short corner with a powerful sweep. The Indians tried to create pressure on South Africa but they failed to penetrate the rival defence. India thus had to settle for the silver to continue their 32-year-old jinx of not qualifying for the Olympics. Indian women had played in the Olympics in the 1980 Moscow Olympics, the year the game was introduced, on an invitational basis. In the men’s section, mercurial Sandeep’s Singh’s five goals propelled India to an impressive 8-1 win over France in the final of the Olympic Qualifiers in Delhi and helped his team qualify for London 2012 as well. The first half was a closely fought affair, with India banging in the first two goals only to see France come back with a brilliant field goal. But then India got another one to go into half-time at 3-1. Sandeep was unstoppable scoring in the 19th, 26th, 37th, 49th and 51st minutes. The other scorers for India were Birender Lakra, who opened the scoring in the 17th minute, Sunil made it 5-1 in the 43rd and VR Raghunath, with a powerful drag flick, made it 8-1 in the 56th. The lone goal scorer for France was Simon Martin, who scored in the 24th minute completely against the run of play. So will it be ‘Happy Days are back again’ and would India repeat the feat of 1980 Moscow Olympics under Vasudevan Bhaskaran – is what all of us hope for !! Recently Dr Meetei was conferred the prestigious State Award on 20th Feb 2012 and that has created controversy because of the statements of our unfriendly neighbour !! - Can you associate the name of Nabam Tuki and the place in the coordinate : 27.06°N 93.37°E. Its name literally means "land of the dawn-lit mountains" in Sanskrit. It is also known as "land of the rising sun"
Mr Nabam Tuki is the Chief Minister of the the Indian State of ‘Arunachala Pradesh’. He is the 7th CM and was sworn on 1st Nov 2011 by Governor Joginder Jaswant Singh. Arunachal Pradesh, situated in the North-Eastern part of India with 83743 sq. kms area attained its statehood on 20th February 1987. It has a long international border with Bhutan to the west (160 km), China to the north and north-east (1,080 km) and Myanmar to the east (440 km). It stretches from snow-capped mountains in the north to the plains of Brahmaputra valley in the south. Arunachal is the largest state area-wise in the north-east region, even larger than Assam which is the most populous. Itanagar, located at an altitude of 530 meters above MSL, is the capital of Arunachal Pradesh It is named after Itafort meaning fort of bricks built in 14th century A.D. Immediately after the Nation’s independence in 15th Aug 1947, North East Frontier Agency commonly known as NEFA became an integral part of the Union of India. It was administrated by the Ministry of External Affairs with the Governor of Assam acting as agent to the President of India. The administrative head was the Advisor to the Governor. In 1972, the NEFA became a Union Territory when Indira Gandhi was the Prime Minister and acquired the name of Arunachal Pradesh. After 3 years, in 1975, it acquired a legislature. And finally, on 20th February 1987 Statehood was conferred on Arunachal Pradesh when Rajiv Gandhi was the Prime Minister and it became the 25th State of the Union of India. It is STATE and AN INTEGRAL PART OF OUR COUNTRY.. The northern border of Arunachal Pradesh follows the McMahon Line, a border delineated in the Simla Accord that was signed by the United Kingdom and Tibet in 1914 ; China has been disputing this and claiming that some of the portions belongs to it. Dr. Kangabam Romeo Meetei, In-charge Adventure Cell Govt. of Arunachal Pradesh has been conferred the excellence award, the Highest State Award for promoting adventure sports in the state of Arunachal Pradesh and other North Eastern states. It was presented to him by Hon’ble Defense Minister Shri. A K Anthony and Hon’ble Chief Minister Shri. 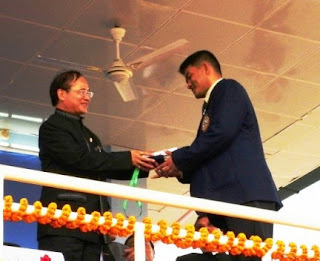 Nabam Tuki, at the function celebrating the 25th State Hood day Celebration 2012 held in Itanagar on 20th February 2012. Under Dr. Meetei two girls namely Mrs. Anshu Jamsenpa & Miss. Tine Mena has scaled the Mount Everest and created many records which bring laurel to the state as well as for the country in 2011. In a statement that smacks of arrogance and rancour, Chinese Foreign Ministry objected to the visit of Indian Defence Minister to our own State. Chinese ministry spokesman Hong Lei stated that India should refrain from taking any action that could complicate the border issue. The official Xinhua news agency said Hong was reacting to reports of "Indian officials participating in activities organized by the so-called 'Arunachal Pradesh' region". Put simply, Beijing does not want the central government to become more popular with the people of Arunachal Pradesh as it would make it difficult for China to press its claims over the region. In its aftermath, Union defence minister AK Antony slammed China for raising objections to his visit to Arunachal Pradesh, describing Beijing's comments on the issue as "most unfortunate" and "really objectionable". 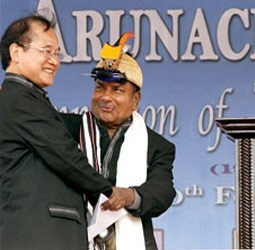 He said Arunachal is an intergral part of India as Jammu and Kashmir and as defence minister it is his right and duty to visit the state, which has recently celebrated 25th anniversary of its statehood. It is time that the Govt. strongly conveys that such objections will not be tolerated and these would amount to inference and meddling to our Internal matters..
At Delhi, in the FIH road to London tournament, all that India needed was a draw to qualify for the finals. The other match between Canada and France ended in 1-1 draw. Italy won its first points against Singapore in a meaningless match. Against Poland, it was the story of many near misses and missed heart-beats as the match was not as comfortable as the final scoreline. Shivendra Singh’s deflection helped our first goal, soon Poland had a penalty corner converted by Miroslaw Juszczak to tie the score again at 2-2! Raghunath Vokkaliga Ramachandra replaced Sandeep Singh on the next penalty-corner and gave back the lead to India. Finally it was a win for India (4-2) - France stayed ahead of Poland in the standings. The Final will therefore be between India and France; Player of the Match was Mariusz Chyla, goal-keeper for Poland. Now India need to win in the Finals to qualify for the London Olympics; earlier Women’s team beat Italy to enter the finals – So, both the teams are just one win away for that coveted slot in London Olympics. All the Best to our Teams to win a Medal in Olympics in Hockey after many years ! Downunder, Srilanka with their win in Hobart have thrown open the predictions and now all the Teams have a theoretical chance to enter the finals – simply none have qualified for the Finals at this stage. Sri Lanka have 15 points from their 6; Australia have 14 and India lowly placed with 10. Lankans might be out, if India win their last two and if they lose to Aussies in their last match. They would also lose if they lose both and concede a bonus point alos to India. Australia has tasted consequent defeats against Sri Lanka – a solitary win would take them through – but if they happen to lose both against India and Lanka, then they would see far off Nations playing the Finals at their home land. It is only a theoretical chance for India – they have to win both their matches; if they lose to Aussies they need to defeat Lankans and gain a bonus point too. So 3 more matches and then 3 finals – will Team India resurge !! rare 12.76 carat pink diamond found in Australia. BCCI floored by Sahara and Vijay Zol – who ?? Afghans' day of reckoning on the field !! Captain Ivan Vikulov catches fire at Azov Sea. IPL Auction 2012 - deciphered !!! Bangladesh Premier League is set to start !! 122 2G Licenses revoked - Who is in dock ?